Foz do Igua�u is a large city in the state of Parana, Brazil. The city is probably most famous as the location of Iguacu Falls, which attracts visitors from around the world. Iguacu Falls sits at the intersection of Paragua and Argentina and together with the cities of Cuidad del Este, Paraguay and and Puerto Iguazu, Argentina, this is one of the largest tourist attractions in South America. Foz do Iguacu sits at the mouth of the Iguacu River. The city has a lot to offer visitors in the form of restaurants, bars, and nightlife. As a major tourist destination, there are also many hostels and budget hotels in the area. Hostels offer a unique social environment that make it easy to meet other travelers and backpackers. 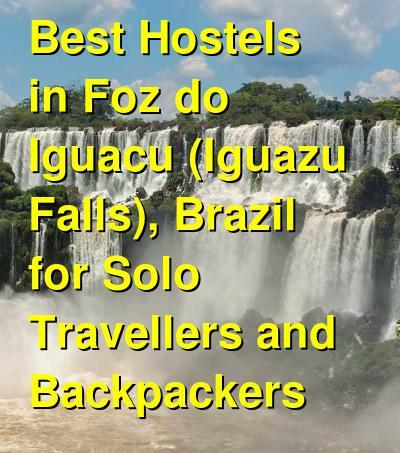 How much do hostels in Foz do Iguacu cost? A good hostel for solo travellers, couples, small groups, and families. Paudimar Campestre Hostel has been around for more than 20 years and it has become a favorite hostel in the area. It's located about four kilometers from Iguazu National Park and is a beautiful setting where you can enjoy a natural outdoor space, nature, and wildlife. The hostel has a lot to offer guests including a swimming pool, an on-site bar that serves both food and drinks, a playground for kids, and a camping area. The hostel also offers daily tours for guests to the waterfalls on the Argentinian side. This hostel has private rooms that include doubles, three bed, four bed, and five bed rooms. There are family room suites and cabins available as well. There are also dorms that sleep up to six people and are split by gender and there's a ten bed shared tent available as well. Che Lagarto Hostel is a fun and lively place to stay that is popular with backpackers to Foz do Iguacu. It's located in a new building that has all of the modern amenities that you could need. There are several great common areas including a living room, television room, patio, and deck that offers great views of the city. There's also a pool and jacuzzi that guests can use during the summer months. The hostel has public computers and wi-fi in the lobby. Guests can also enjoy a delicious breakfast every morning. The hostel is conveniently located in the center of Foz do Iguacu right by the bus stop for Iguacu Falls. It's also close to the zoo and the main bus terminal. In the surrounding neighborhood you'll find plenty of great bars and restaurants. This hostel is part of the hostel chain, Che Lagarto Hostels. It's the largest hostel chain in South America and it offers reliable service and quality. This hostel has double, three bed, and four bed private rooms as well as four bed dorms that are either co-ed or female only. Tetris Container Hostel is uniquely made with shipping containers. The unusual design makes for a fun place to stay. There's a large recreation area, a swimming pool, a bar, and many places where guests can relax. The hostel is conveniently located on the main road that travels between the airport, the waterfalls, and the city center. This location offers easy access to anything in the area that you might want to see or do. Nearby you'll also find many restaurants, cafes, and bars. This is a fun and comfortable place to stay. There's a shared kitchen which guests can use, and the staff can help you organize all kinds of activities including tours to the waterfalls, skydiving, and more. All of the rooms are air conditioned and each room has a private bathroom. Dorm beds come with security lockers, lamps, and power outlets. Private rooms include doubles, four bed, and six bed rooms. Dorms range in size and include four, ten, and twelve bed rooms. Both female only and co-ed rooms are available. Hostel Bambu is the place to stay if you're looking to have a good time. It's one of the most popular hostels in the area and the staff make sure everyone has a good time. The hostel is located in the downtown area and is just 25 minutes from Iguassu Falls. It's also walking distance to the city's main avenue which is where you'll find the best bars, restaurants, and nightlife. This is a favorite hostel in Brazil, and you won't be disappointed. It has a great atmosphere where it's easy to meet other travelers from around the world. The staff is friendly and fun and they speak a range of languages including Portuguese, English, Spanish, and French. The hostel has private double rooms available as well as five, six, eight, nine, and ten bed dorms.